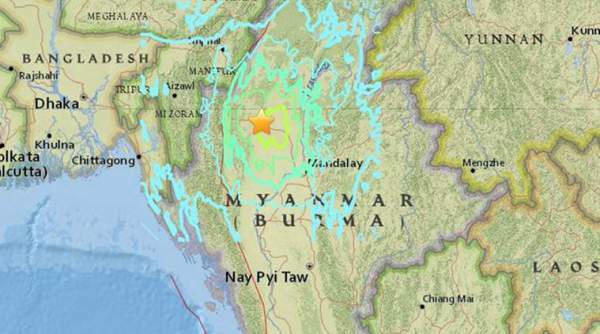 The earthquake was measured about 6.9 on the Richter scale, and the epicenter was found out to be at a depth of 135 km north of Myanmar capital Naypyidaw as per the reports of the US Geological Survey. The people living in the Yangon city panicked as the quake hit them. Authorities haven’t reported any damage yet. The tremors originating from this earthquake were felt in Kolkata, Guwahati, Patna, Bhubaneswar, and Delhi. # Three admitted in hospital in Siliguri (WB). Panic caused. # 7 hospitalized due to trauma, other two admitted to RIMS in Imphal (Manipur) after injuries. # epicenter was 396 kilometers (246 miles) north of Myanmar’s capital, Naypyidaw. # Three admitted to hospital in Siliguri (West Bengal). # No casualties reported in Sikkim, Siliguri, and Kolkata: NDRF. # Nothing reported yet, waiting for reports from border area: Mizoram Police. # Population estimate in the radius of epicenter. 8 pm IST – GDACS said that it would have a high impact on human as per the magnitude.